So, what about other proteins? There are cheeses other than cottage cheese, and there’s nut butter (cashew-almond butter being my current favourite). Both of these are more appealing, but they need something more — a base to ground them, like bread or crackers — to really go well with coffee. This wouldn’t be a problem, except for the gluten-free part. Most gluten-free bread I’ve tried is, well, fairly horrid. Dry and crumbly or overly soft and squishy. A few exceptions I’ve found locally are the baguettes from (now closed) My Goodness! Gluten & Wheat Free Kitchen and Lemonade Gluten-Free Bakery. 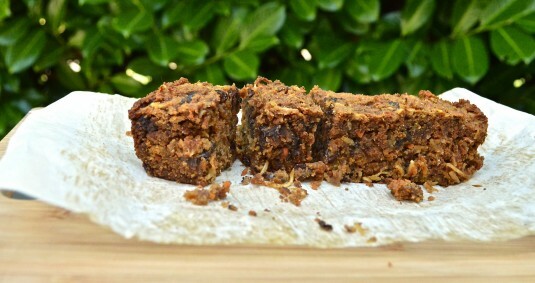 After racking my brain a little, I started experimenting with breakfast bars. 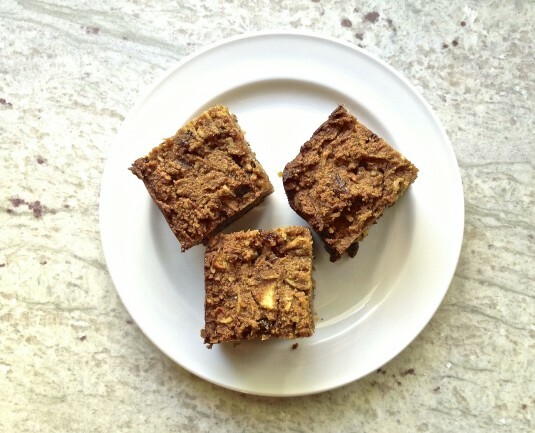 I’ve made several lately, some with gluten-free oats, some with cooked quinoa and quinoa flakes. I’ll keep experimenting with them because they hold some real promise. But for now, I’ve settled on carrot apple breakfast cake. Yes, cake. Cake for breakfast! 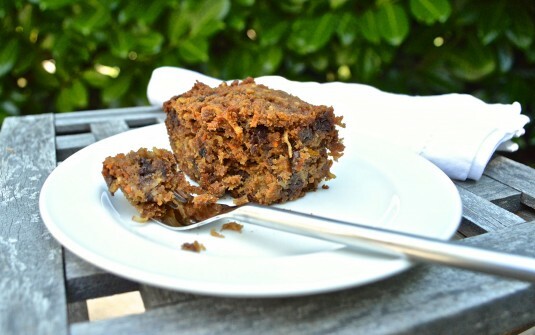 A combination of grated carrots from the CSA, grated apple and two grain-free flours (almond and coconut) make for a satisfying, great tasting and healthy cake. It’s similar to a muffin texture, dense and chewy, with shredded coconut, orange zest and nuggets of dried sour cherries adding some kick. The almond flour gives it protein (check), and it’s not only gluten free but entirely grain free and low enough in sugar that I’ll qualify it as Paleo friendly. Plus it goes so well with my morning coffee that it makes me smile. Top points for that. Adapted from the Morning Glory Muffin recipe in Paleo Comfort Foods by Julie and Charles Mayfield. The dried sour cherries were delightfully tangy, but if you don't have them on hand substitute another dried fruit like raisins, dates, figs or apricots. Combine dry ingredients -- almond flour, coconut flour, baking soda, salt and spices -- together in a large mixing bowl. Add carrots and apple to the dry ingredients and mix until evenly combined. Add the syrup, coconut oil, vanilla, and orange zest and juice to the beaten eggs and mix on medium speed until well combined. Add dry ingredients to the egg mixture, and mix on low speed until combined. Add cherries and coconut and mix until combined. Remove from oven and let cool before slicing into squares. A note on blanched almond flour: I use the Honeyville brand, which is very very fine and powdery -- much finer than almond meal, and finer than other brands of almond flour I've seen (like Bob's Red Mill). Such a fine almond flour allows your baked goods to have a finer texture, closer to what you'd get if you were using all purpose wheat flour. Here is a good explanation of the difference between coarse and fine grains of almond flour. It also has tips on what to do if you just have almond meal on hand and want to substitute it in recipes. This looks wonderful, Kris. How many servings does it make? Hi Daphne, it makes 16 large squares. But you can always make the pieces smaller — I cut the cake in 4 long strips across and then sliced each strip up into bigger or smaller pieces….depending on how hungry I was! Hope that helps. Thanks! It sounds so delicious! You’re most welcome! It is really moist and delicious, and fairly healthy. There is a fair amount of fat in the almond flour, but this cake is great when you’re on the go and have an active day ahead of you. I found a small square kept me full for hours!